Have you ever noticed how your chocolate syrup coils when you pour it on your ice cream? Or how the soft ice cream doesn't just fill your cone up like water would, that it forms large loops instead? Our hypothesis is that it is due to the thick nature of these liquids. They belong to a group known as "thyrotrophic" liquids. That is, they are liquids because they are not solid, but they are, in some cases, incredibly thick and viscous. The reason motor oil is used in engines is because it is thick enough to stick to the piston shaft and stay there for a relatively long period of time. As we all know, the colder an object is, the closer together its molecules become due to the lessened energy state. It is our belief that this can affect the coiling of certain liquids. Also, the size of the stream could possibly have an effect, because without the correct amount of molecules, the stream should just fall straight. The size can be affected in two ways: by changing the size of the funnel's diameter, and by changing the height at which the funnel is placed. Perhaps the material of the surface onto which the liquid is poured can affect its coiling ability. To determine why certain liquids coil, and what conditions control this coiling effect. 1. Set up the ring stand. Place a clay triangle on the ring, then place the appropriate funnel on the ring stand. Decide which variable will be worked with, set up the experiment as such. Pour quantity into the funnel, while blocking the spout on bottom, to prevent the flow. Remove the stop from the spout and time the pouring of the liquid for 20 seconds while counting the number of coils it makes during that time. Change the value of the current variable you are working with. Repeat steps 4-6 for several more values with that particular liquid. Repeat steps 3-7 with a different liquid. Repeat steps 3-8 with a different independent variable. Figure showing Data Table And Graphs For Number Of Coils On Four Different Substrates (Glass, Aluminum, Plastic, and Metal). Machines in outer space use liquid fuels. It is not desirable for these liquids to coil as they enter the combustion chamber, because it is inefficient and dangerous. This is due to the fact that the fuel could coil back into the fuel line where combustion could take place due to a chain reaction thereby destroying the fuel tanks and everyone in the vehicle, not to mention the vehicle itself. The coiling can be controlled by varying the temperature of the fuel. Some more “down to earth” applications would be in the food industry. Currently when you’re getting a soft ice cream cone the server has to move their hand in a circular motion to the “coily” shape. By adjusting the temperature and the pressure of the ice cream dispenser, the ice cream could be forced to coil on its own. This would be helpful and reduce preparation time as well as reduce the risk of carpel tunnel syndrome. Liquid metal, being relatively thick, should coil. So if it were poured into a vat of super cooled liquid it would be produce a spring with a very small diameter. The variables could be changed to change the spring’s “spring constant” for various uses. This would save on the construction of machinery needed to build these springs. It would also create springs that do not have seams in them, thereby making them stronger and durable. The majority of the experiments proved that there are a maximum number of coils for each variable. In the variable temperature experiment, there appeared to be a maximum number of coils. Any temperature above this the number of coils dropped. Similarly, as the temperature of that liquid was dropped, the number of coils decreased. 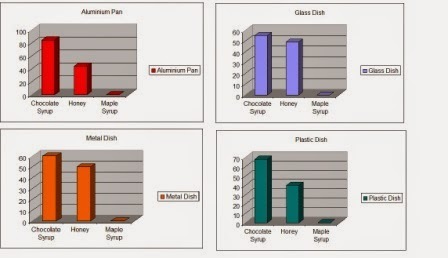 The maple syrup’s ideal temperature is considerably lower than that of honey and chocolate syrup. The ideal temperature is determined by the thickness of the liquid. The coils are caused by molecular backwash. As the molecules hit the substrate, some of them ‘bounce back’ towards the stream, blocking the path of the stream, and thereby creating coils. If there are too many molecules, then the coils will not form, because the mass is too great, thus, when the flow rate is increased the number of molecules in the stream increases. Comparatively, when the flow rate is decreased, due the fewer molecules in the stream, the backwash is less, causing fewer coils. According to the experiments, the substrate upon which the stream is poured has little to no effect on the number of coils. As the height of the funnel containing the liquid is increased, the number of coils increased for the honey. This is because of the decrease in molecules at the point of contact, therefore spreading out the thicker liquid to make more coils. However, in the case of chocolate syrup, the amount of coils increased to a point. This is because at the beginning height, there were too many molecules, but as the liquid began to taper the coils started to decrease again. Two of the funnels we were using had the same diameter spout, but one of them had ‘coiling guides’ in the mouth of the funnel. For the honey, it appeared to increase the coiling; it is because it had already started to spiral within the shaft. Although we did not do an experiment on the application of force, it appears that by applying a force to the liquid it appears that the coiling can be increased, this was seen, both with the bottle of chocolate syrup and catsup.